Perfect for breakfast on the first day of school! We’ve had an amazing summer that went by way too quickly! It’s hard to believe that school is starting already. One of my favorite traditions that I share with my daughters is our first day back to school celebration. We wake up early on the first day of school and get ready as quickly as we can and then have a special breakfast and talk about all of their goals for the new school year. 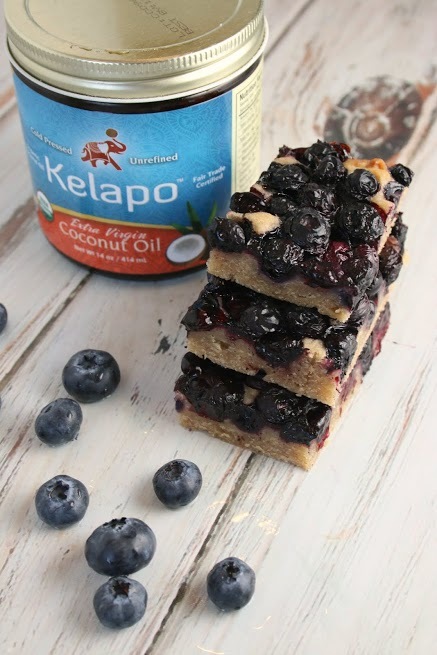 This year it seems like there are still tons of fresh blueberries available and since those are one of our favorite fruits I decided to make them Blueberry & Coconut Bars for our back to school breakfast celebration. These are perfect to make the night before and serve as a special breakfast or you can have them ready fresh out of the oven as an after school snack. 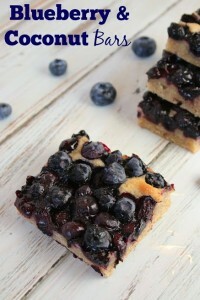 I used fresh blueberries, but I’ve also made these with frozen blueberries and they were awesome that way too. These bars are also not super sweet, which is how we prefer them. I think they have just enough sweetness to balance the blueberries out, but if you like a little more sweetness feel free to increase the sugar a bit. 1. In a mixer add all the ingredients except for the berries. 2. Mix on high until the batter is smooth. 3. 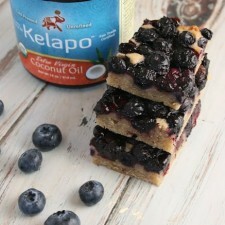 Pour into an 8×8 pan that you sprayed with Kelapo Coconut Oil Spray first. 4. Add berries and push them down into the batter. Try to make sure that the berries are evenly distributed. 5. Bake at 350 degrees for 40 minutes or until the top is golden brown and a toothpick comes out clean. 6. Let cool for 45 minutes before serving. Hope you have a great back to school time!